We never had this growing up in my house...this probably has something to do with the fact that pepper jelly never crossed our door. But since I married into the Criswell family, this is a staple. It's really simple. It requires only cream cheese, pepper jelly and something to spread it on. 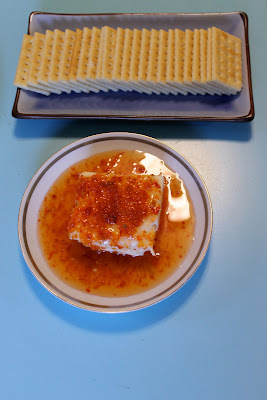 Simple, but deceptive because I really enjoy eating this appetizer. 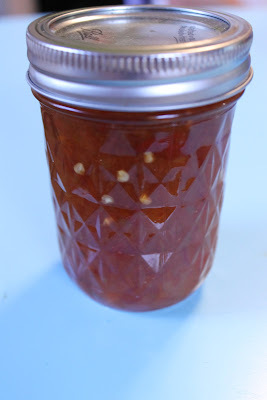 Now, once upon a time my mother in law and I made a pepper jelly that didn't properly congeal. I know I am not alone in this phenomena... I still have some of it left, to be honest. ONe would think that since it didn't jelly properly, it wouldn't be as tasty--wrong! It's just as good. So that is why my jelly looks this way in picture. Don't worry, though, the jellied jelly tastes just as great on the cream cheese!!! Behold: pepper jelly. See those seeds just waiting to getcha!?! Take a block of cream cheese, cut it in half. Put it on a fancy pants plate. Put your pepper jelly on top. Serve with some crackers and EAT IT UP. This stuff will knock your little socks off.